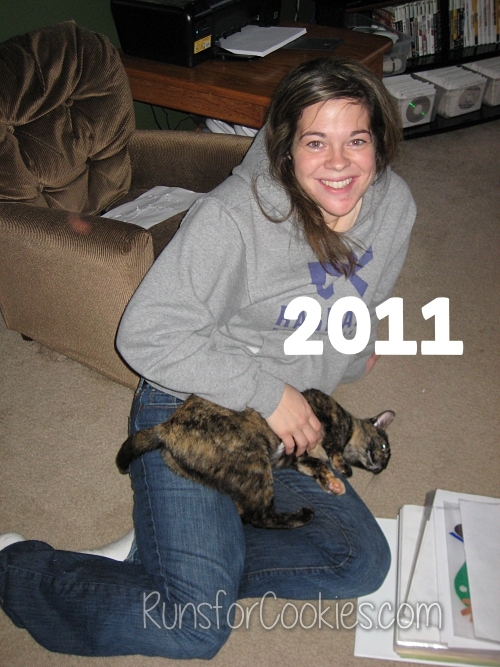 When I started this blog, I wrote the "Top 11 of 2011". I had been planning to write a Top 10 list, but since it was 2011, I figured one more wouldn't be hard. Each year, I add one more item, and each year, I think it's going to be impossible to come up with that many things. 1. I made a list of 40 goals to achieve by the time I'm 40 years old. Several of them are goals that I will continuously work on over the next three years, and some of them can be done in a day. 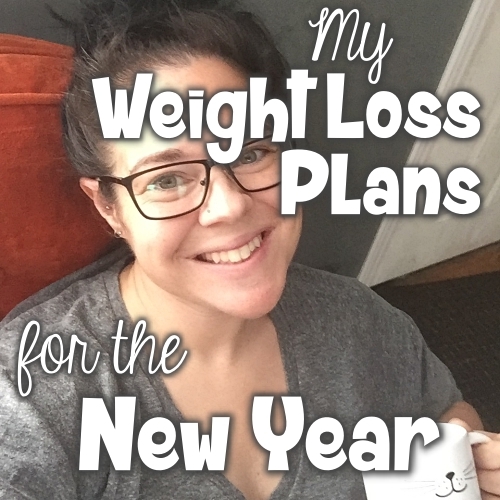 It's been fun to focus on goals that don't have anything to do with weight! 2. Jerry and I went on a super fun date night. 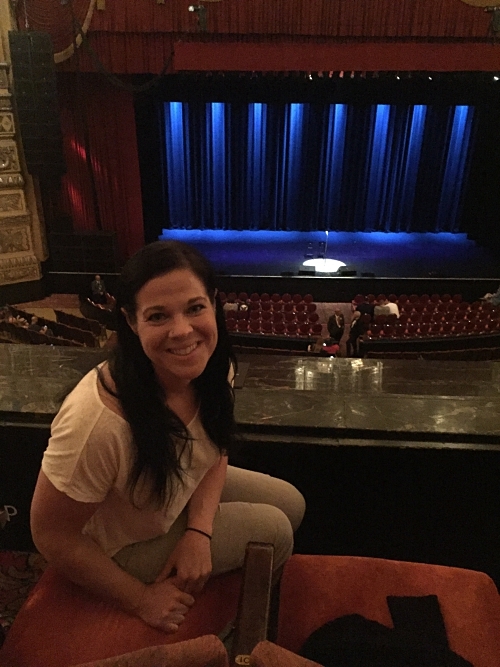 We spent an evening in Detroit to see Bill Burr's stand-up comedy at the Fox Theatre. We stopped in a nice little bar for drinks before we went to the show, and had great conversation. Then we walked to the Fox and we both agreed that Bill Burr was hilarious. We don't do things like that often, and it was super fun. 3. I shared a Vermonster with the family! 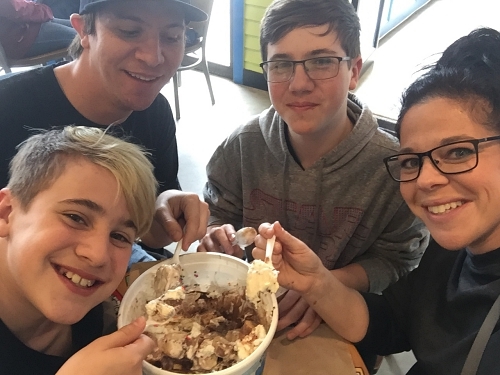 When the kids were younger, we used to watch random shows on the Food Network, and when we learned about this giant ice cream sundae that is served at Ben & Jerry's in Vermont, well, we decided that one day we would go there and get one. 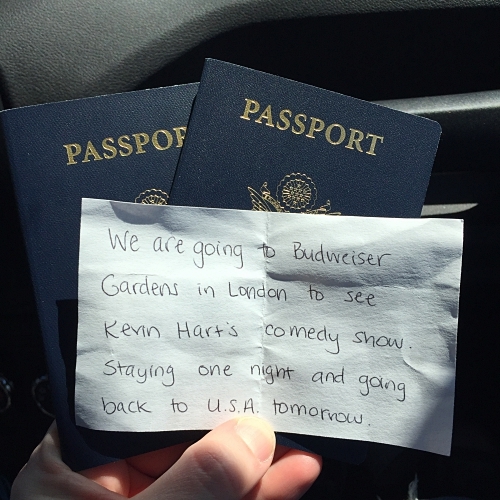 Last Christmas, we surprised the kids with our vacation plans. We were all super excited for this Vermonster! 4. I visited Portland, Maine. When we left Ben & Jerry's, we drove to Portland, Maine. Portland was AMAZING and definitely on my list of favorite places I've visited. 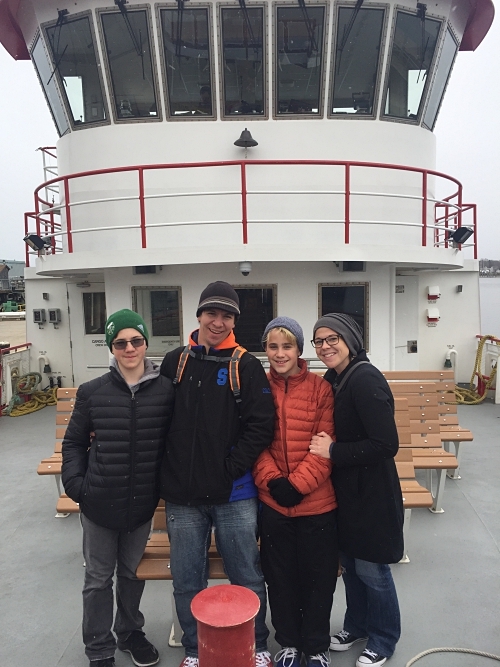 We went on a mailboat tour of the islands, and the scenery was so pretty! Especially when it started snowing very lightly. 5. I showed the family my favorite things to do in Boston. The first stop on our trip was actually in Boston. I planned for this trip for so long, and I was excited to finally get to take the kids to a relatively busy city. 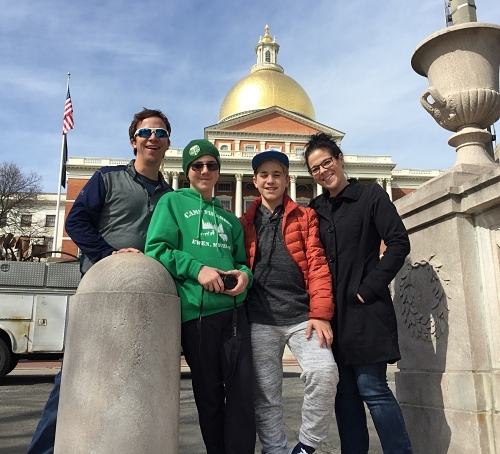 They loved walking the Freedom Trail, and I loved getting to spend time with the family, uninterrupted. 6. I took Eli to get his ears pierced. Eli wanted to get his ears pierced, and I didn't want him to get it done at the mall. He needed the full piercing/tattoo shop experience! Haha. 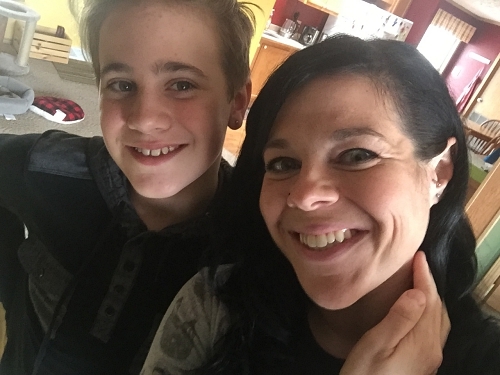 So, we made a mother-son date of it, and he got his ear lobes pierced while I got the tragus on my ear pierced. My favorite part about this whole thing was that Eli is totally his own person. He knew that he'd get teased at school for the earrings, just like he was teased when he dyed his hair blue; but he knew what he wanted, and he did it anyway. I wish that I had been that brave when I was his age! 7. I did an escape room challenge. Doing my first escape room challenge! This was on a girls' trip to Kansas City to visit my friend Andrea. Caitlin came in from Boston, and Bonnie from Virginia, and we stayed at Andreas for a long weekend. We had so much fun, especially doing the escape room. 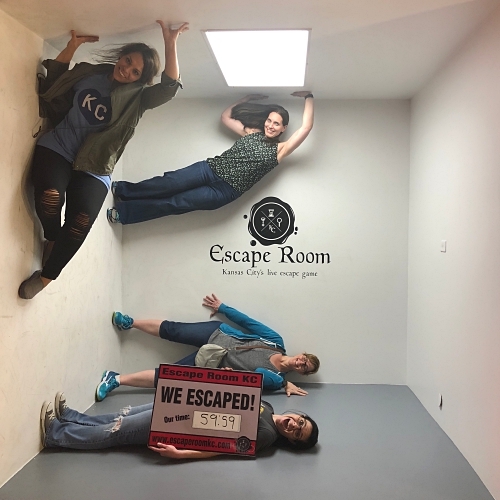 We had 60 minutes to complete it, and we managed to get out in 59:59! It was a huge adrenaline rush. 8. I learned lots of new skills while making over our house. One of my favorite parts of 2018 was working on our house and giving it a really dramatic makeover. We aren't totally done, but it won't be too much longer. I can't wait to post all of the before and after photos! I feel so proud when I see how much better everything looks. And I did it myself! 9. I took Jerry on a surprise date. 10. 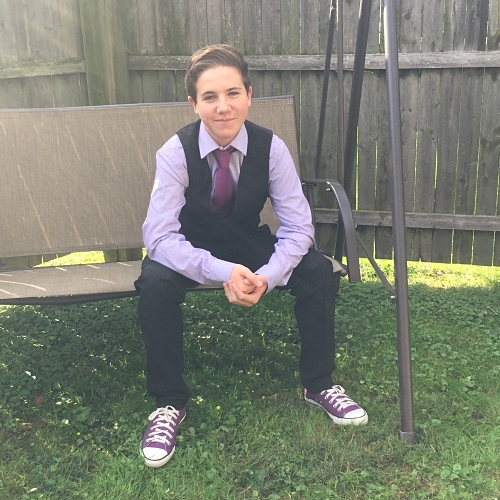 I saw Noah go to his first homecoming dance. He's growing up so fast! He looked amazing in his suit (and he actually let me pick it out). He met up with his friends (including his girlfriend) where they took some group photos and then went out to dinner. Jerry and I drove him and his girlfriend to the dance and dropped them off. Noah was very nervous, especially about wearing the Converse that I pushed him into, but he had so much fun! 11. 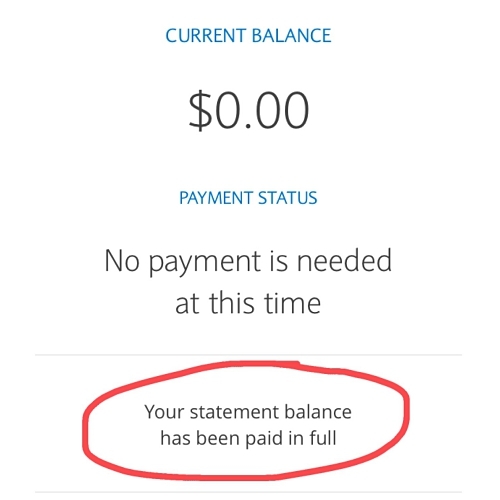 We paid off all of our credit debt! This was SUPER exciting. We'd had credit card debt for as long as I can remember. Once I started taking medication for bipolar, my mood stabilized enough for me to stop being so impulsive. I made a budget plan and we stuck to it. 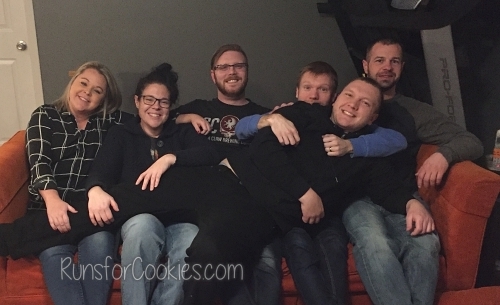 We paid off $14,500 in 14 months, and it felt SO freeing! We have continued with our budget so that we can pay for our home makeover as we go, instead of charging it all and paying it off later. 12. Cashing in several years' worth of change. Jerry, the kids, and I saved up all of our (by "our" I mean 95% mine) change in the piggy bank and finally cashed it in. 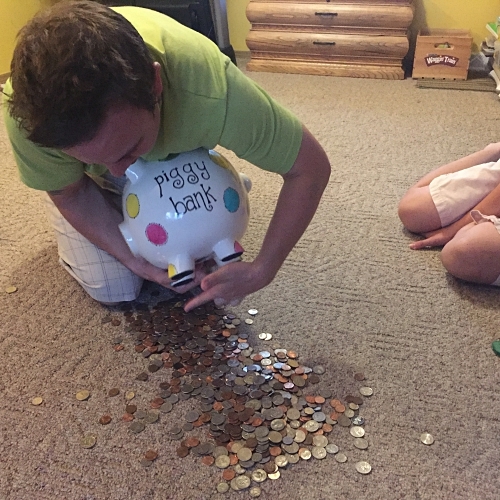 I told the kids about a year ago that if they put all of their change in it, they would get to split it all with us when we cashed it in. We finally filled the entire bank (it weighed about 40 pounds!) and then cashed it in. We had $490 in change! 13. 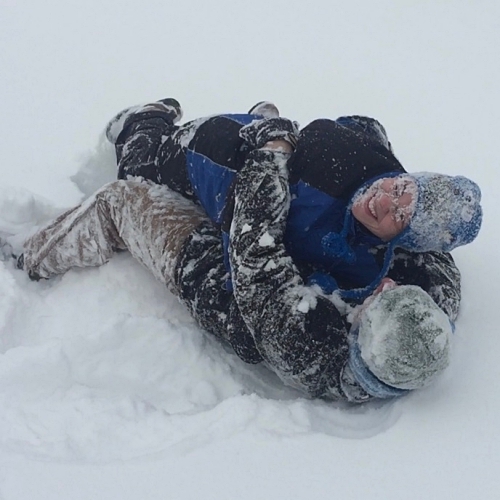 I played in the snow with the family. 14. The kids and I rode our bikes to Subway. This may not sound like a big deal, but it was about 11 miles round trip, and included some busy roads. 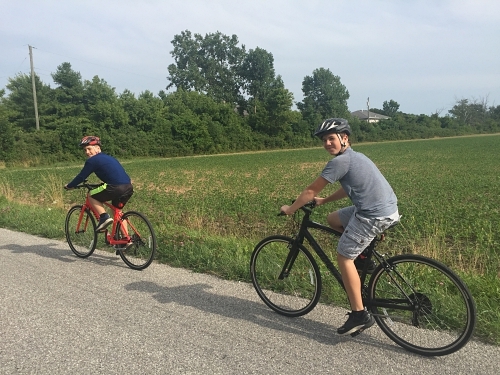 I was scared to death letting the kids ride on those roads, but they were very proud that they rode so far (and thrilled to eat Subway for dinner). 15. I became an aunt again! 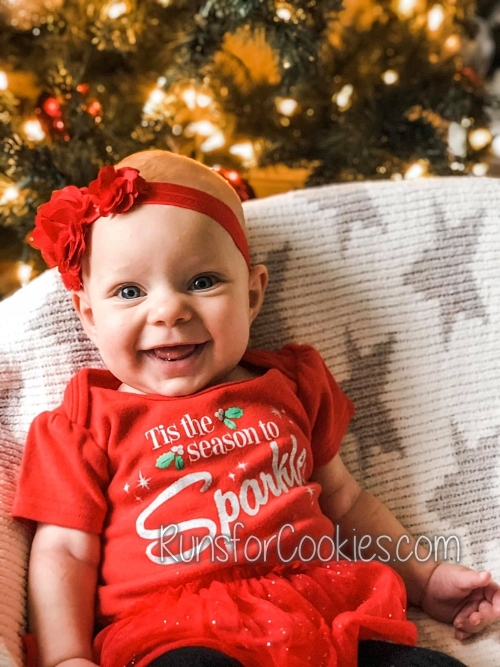 Miss Riley Jo was born in August, and just like that, I had a niece :) She has the biggest, most contagious smile I've ever seen on a baby. I've LOVED being an aunt to Luke, and now it's going to be super fun to do girl things with a niece! 16. I trained for a half-marathon with Jerry. While we didn't end up running the race, we did train all the way up through an 11 mile long run. I'm not sure why I enjoyed it so much, but we had a great time on our long runs. We ran nice and slow, not caring at all about our pace, and chatted the whole time. 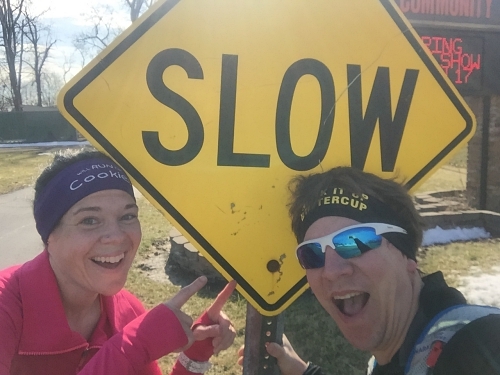 Training with a partner made the time go by faster, and it felt less like work and more like enjoyment. 17. 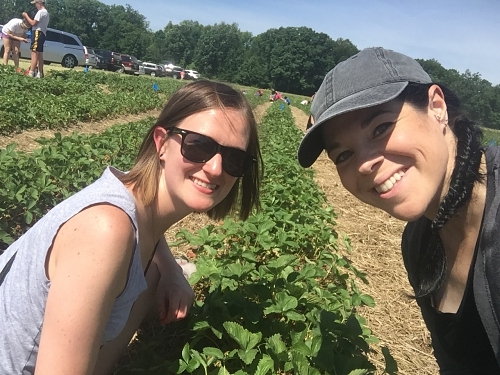 I went strawberry picking with Emily. Then we made strawberry jam and strawberry margaritas afterward! Emily is a blog-reader-turned-dear-friend. I had never gone berry picking before (maybe I did when I was a kid, but I don't remember) and it was a goal on my 40 Goals by 40 Years Old list. Picking the berries was relaxing in a way--we just talked and made our way down the row, staining our fingers and taste-testing a few berries. I definitely want to do it again next year! 18. 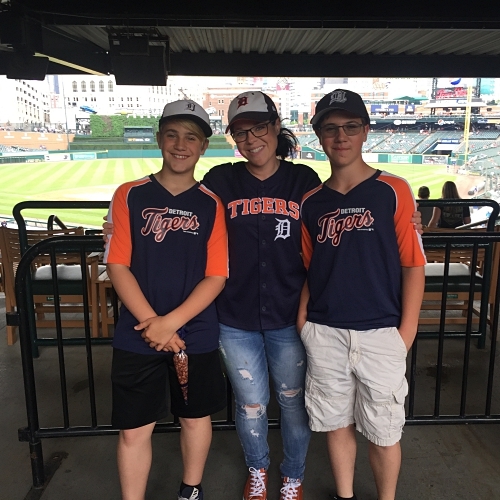 Jerry and I took the kids to a Tigers game in May. It was MISERABLY hot (over 90 degrees and so humid), which is always the case when I go to Tigers games. I have no idea why it always happens that way. Regardless, we had fun--and we even randomly bumped into my brother (Nathan) while we were there! And there it is! My favorite moments of 2018. I feel like 2018 was a year of accomplishments--mainly paying off our credit debt and making over our house. I worked SO hard on both of those things, and I'm very proud of the outcome. I have some ideas for 2019, which I'll probably write about tomorrow. But I definitely want to keep it simple; I'd like to pick 2-3 goals to focus on instead of a whole bunch of things at one time. I ran 279.16 miles this year. Almost as low as last year, if not for the half-marathon training. 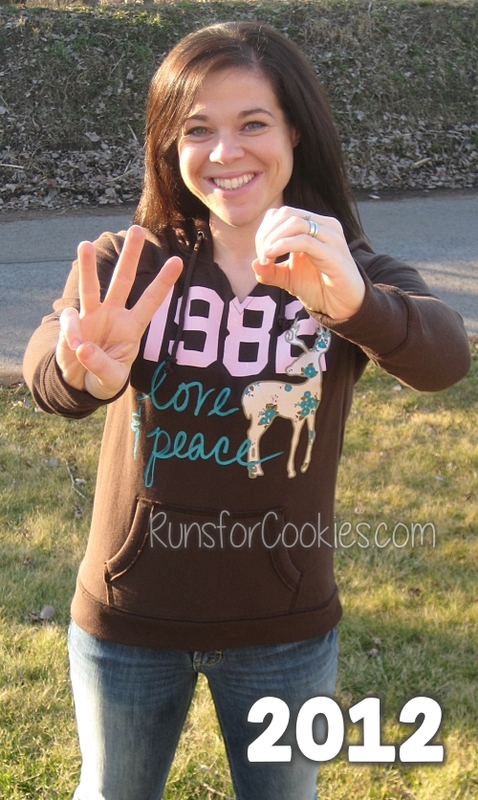 In September of 2013, I actually ran 205 miles in a MONTH. I don't know if I'll ever get my running mojo back, but I'd like to keep trying. 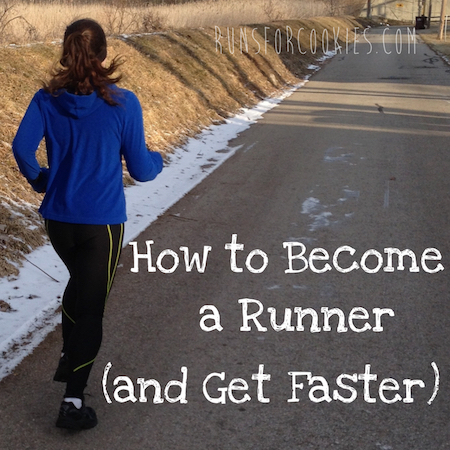 I felt really good when I was running regularly. Now, it's so hard to get back in that habit! The food I consumed the most of this year was definitely crushed ice from Sonic (technically not really food, but I eat it like it is). I've always been an ice chewer (yes, it's a bad habit, and no, it's not due to anemia or anything like that). My friend Sarah told me that you can buy bags of ice from Sonic (they have the best ice!) and once I learned that, I always have it with me. My most memorable meal was OBVIOUSLY the Vermonster at Ben & Jerry's ;) Other than that, though, I would say it was probably having Kansas City BBQ when I went on my girls' trip. My current favorite breakfast is sourdough toast with coconut oil. 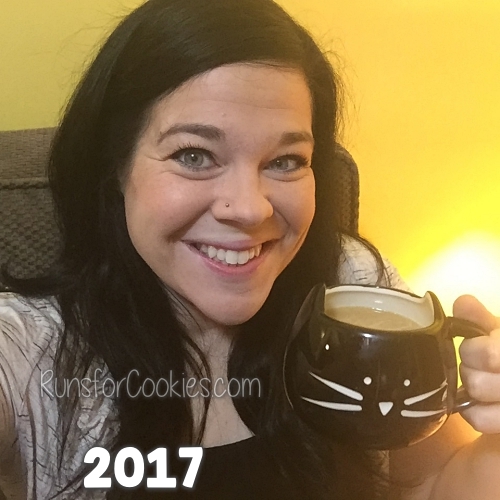 My current favorite TV Show is "The Good Doctor"
What I am most looking forward to in 2018? Finishing our home makeover! It's been so long since I've posted! The time goes by so fast over the holidays. Only two more days left of 2018--I cannot believe it. 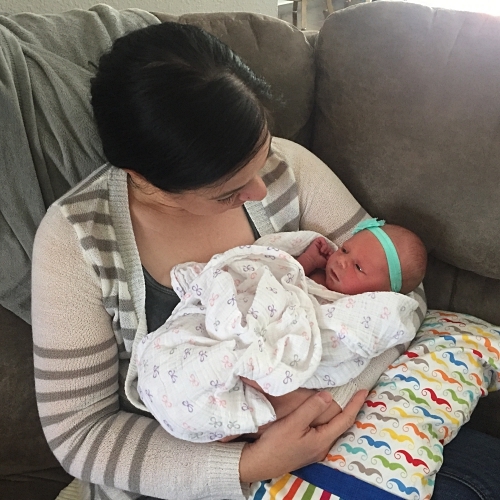 We haven't really been up to anything super exciting, so I'll just recap a few highlights over the last week or so. On Christmas Eve, Jerry and I took the kids to Jerry's parents' house to exchange gifts with them. Jerry's parents gave us a gift card to Lowe's (which is much appreciated, considering how much time/money I've spent there in the last four months!). 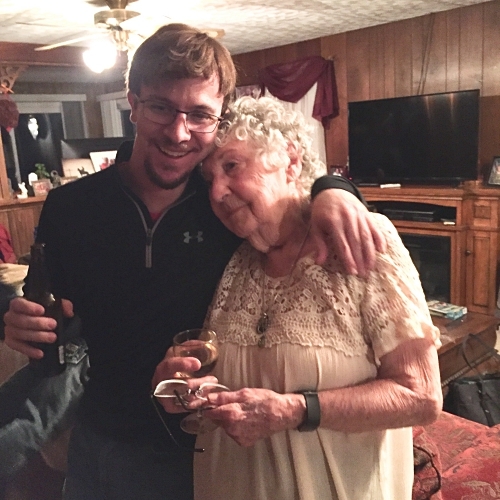 It's funny--a few days prior, my mom called my house to talk to me and Eli told her I wasn't home. She asked where I was, and he said, "Probably at Lowe's." Hahaha! When I'm not at home or driving the kids to/from school and activities, I can usually be found at Lowe's. On Christmas morning, my parents, Nathan, Brian, Becky, Luke and Riley came over. When my kids were the only ones in the family, I always invited everyone over to watch them open gifts. I was so happy when Becky said they wanted to come again this year. I always keep it super low-key (Christmas should be stress-free, in my opinion... although that's a bit of an oxymoron). I made coffee cake and my mom brought over a couple of other things for breakfast. Then we had a lazy morning watching the kids open presents. My kids are at the ages where watching them open gifts isn't quite as exciting as it used to be, but watching Luke was SO entertaining! He'll be two years old in March, and this age is so funny. He asks what everything is and repeats words constantly. He loves to watch us do something and then try to do it himself. 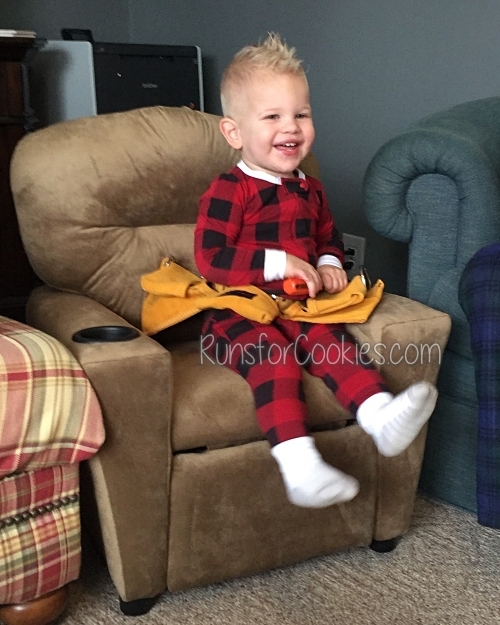 We bought him a little recliner--my kids had one when they were little (although theirs didn't have a cup holder!) and they loved it. Nathan gave Luke a little battery operated four-wheeler, and he spent some time putting that together. Luke was super interested in watching him, so I ended up digging out the gift I'd put away for his birthday and giving it to him then. It was a tool belt with a bunch of toy tools. He immediately got out the hammer and started "fixing" his four-wheeler. 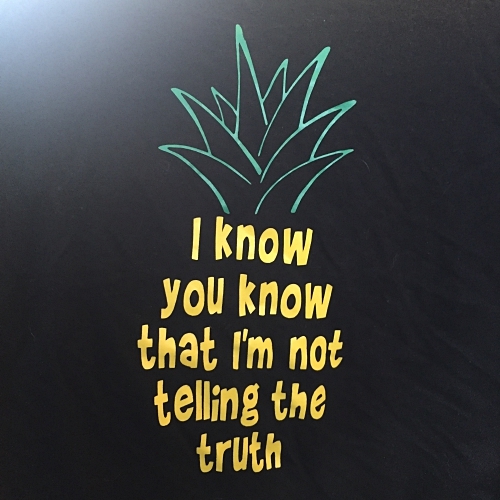 My kids were probably just humoring me when I asked what their favorite gift was, but each of them said it was the shirt I designed for them. 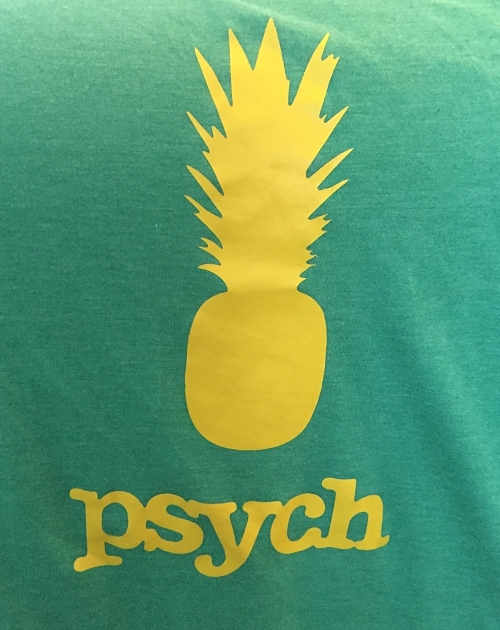 (I love to design shirts and then get them printed at a local shop--I can buy shirts for cheap at the craft store and then get the design printed for $4-7.) I use the word "design" loosely--it usually involves browsing through Google images for inspiration once I have an idea of what I want to do. 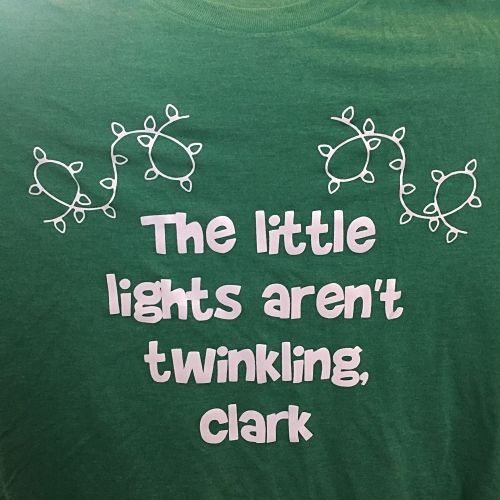 On Eli's shirt, I included part of the lyrics for the show's theme song--it's super catchy and we all sing along when watching. Since we had my family over on Christmas, and I knew we'd be having my childhood friends over on the 28th, I was really hoping to find a loveseat or small couch to finish off the living room furniture. Without it, we didn't have much seating. I'd been looking at Facebook Marketplace every day waiting for the perfect one to come along. I wanted a good quality couch that wasn't going to fall apart. And on Christmas Eve, we got one! It was a sofa I'd seen several times while browsing, and I was interested, but one thing that bothered me was that the cushions on the back looked a little deflated. I really liked the shape of the couch, though (a crescent shaped front) and the size, so when I saw that they'd lowered the price to only $50, I inquired about it. When I asked about the fabric, they sent a picture of the label, and I saw that it was a Sherrill sofa! Sherrill is a high-quality brand, and when I learned this sofa was Sherrill, I was sold. Jerry and Noah picked it up on Christmas Eve morning. When they were bringing it inside, I wasn't thrilled with the color--it wasn't as gray as I thought--but once they set it in the living room, it actually looked pretty perfect. It fit where I wanted it, and when I sat on it, I announced it was the most comfortable couch I'd ever owned. And I discovered that the reason the cushions on the back didn't look very full is because they are filled with some sort of synthetic down or a down blend--SO squishy and comfortable. Everything about the couch was in fantastic shape and I couldn't stop exclaiming how comfy it was. My kids and Jerry agreed. 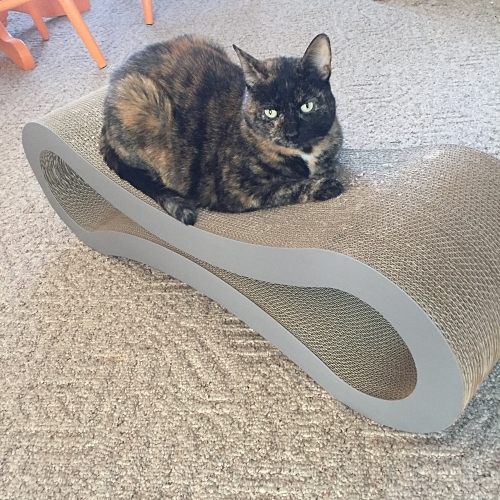 I've been worried about the cats scratching up the new (used) furniture we have, so I bought them a scratcher on Amazon. They LOVE this one. They are always scratching it, but they also like to sleep on it. And the best part is, they have not touched the furniture at all. I felt stupid paying so much for a scratching pad, but it was worth every penny. On Friday, some of my childhood friends came over. We get together every Christmas, which is a fun tradition. We all grew up on the same block and have been friends for over 30 years, so we love to reminisce about our childhood days. It was SO much fun to see everyone. I made a list of Jeopardy-like questions about people and places from our old neighborhood, and reading those out loud prompted some memories that I'd completely forgotten about. Jerry was off work yesterday, and I declared that I wanted a day for us to just completely veg on our super comfy sofa and watch movies all day. We hardly ever have days that we literally don't have anything going on, so it was really nice to do nothing. I wish that our floor was done, because that will really make the whole thing look put together, but aside from the floor (and the island countertop, which we are hoping to do tomorrow) it looks pretty good. I'm thrilled with the way it's all turning out. 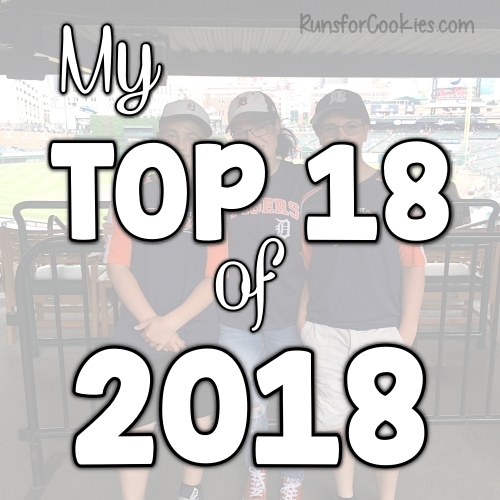 Every New Year's Eve, I write a post about my top moments of the year. I haven't even started thinking about it yet, so I'm going to start working on it now. Hopefully, I'll have it ready to post tomorrow. 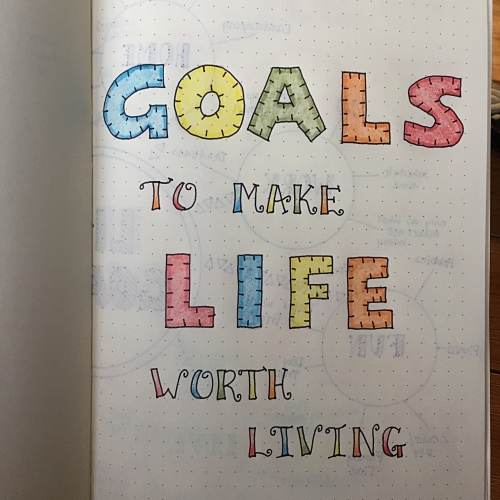 I've always loved setting goals, but they seem extra special when it's time for a new year to start. That said, it totally contradicts my post about "Waiting until the new year". If we make changes that we're willing to live with forever, then we shouldn't have to wait until January 1 to start. Regardless, there is something motivating about that first day of a new year. And now, being the highest weight I've been in eight years, I am starting to feel a little panicked. 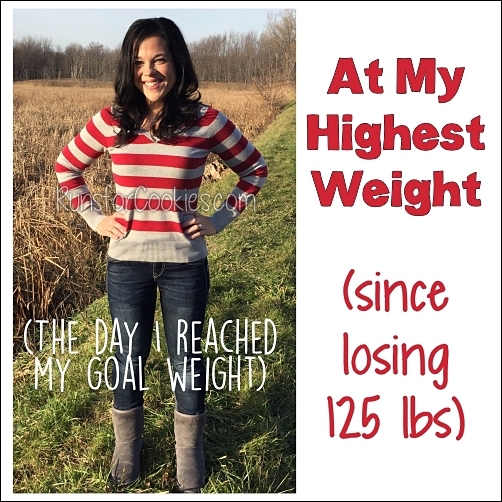 I thought it would work itself out, like it usually does when I pick up some weight, but I am just having the hardest time getting the scale to budge. Last year, I was doing great with my own little combination of intuitive eating and eating only at certain times of the day (8, 12, 4, and 8). 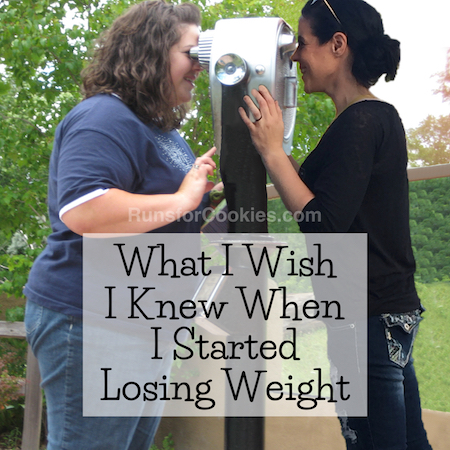 It was a year ago that things started going downhill and my weight started going uphill. I was REALLY worried about Jerry, and I focused more on that than I did on anything else. Recently, I tried the experiment with intermittent fasting. 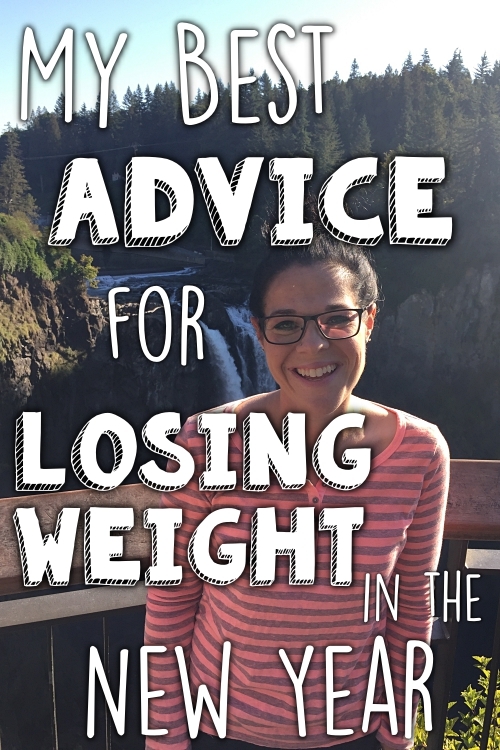 While I really liked it (mentally, it really helped me to stop thinking about food all the time and it felt easy to do), I didn't lose a single pound. I may have been overeating, but I didn't want to count calories AND fast. I was hoping the fasting would be an alternative. I've lost a lot of the intuition that I'd built last year, so intuitive eating (by itself) just isn't working anymore. I definitely don't want to do Weight Watchers, or Keto, or any of the other "diet" plans out there. So, I've decided to go back to what has worked so well for me in the past--counting calories, and nothing else. 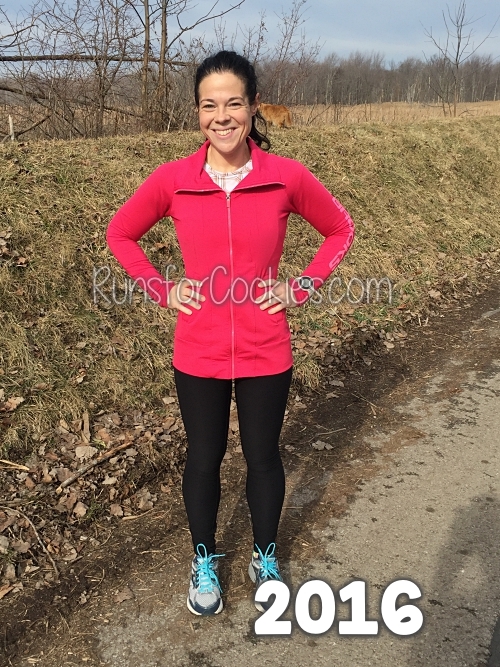 When I dropped 40 pounds pretty quickly in 2015-2016, I was simply counting calories (along with training for the 10K). 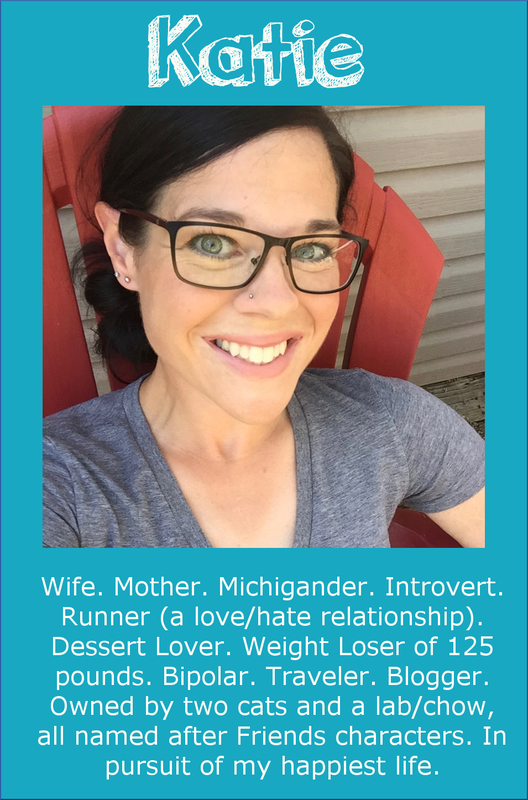 I made the calorie counting work in a way that fit into my lifestyle. I didn't worry about what food I was eating (I ate what I wanted most) and I ate four times a day (8, 12, 4, and 8). I kept my portions moderate. And I felt good! Counting calories is something I know well, and I know that it works for me. I don't feel deprived while doing it, and there aren't any "rules". The biggest drawback (for me) is portioning out food, especially while cooking. I'm going to use my Fat Secret app to keep track of my calories. 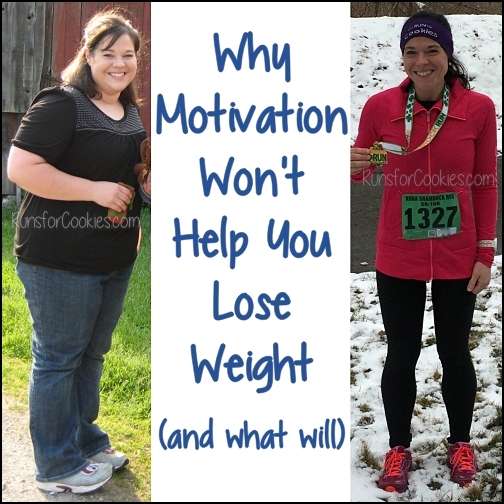 (Funnily enough, as I was looking up that link, I found this post that I wrote in April about my plan to get back to my goal weight. We'll see if I'm any more successful this time! Haha). I also like a paper copy, so I'm going to do the old school tracking method, too. I'm not going to make any claims just yet about running and if/how/when I'm going to get back to a routine. Each time I think I'm ready, something happens that I just stop doing it. Lately, it's been working on the home remodel. I've spent every spare minute working on that. Other than the island countertop and the flooring, we are pretty much done (aside from just a few minor things that aren't on a time crunch). My sister's weight is up a bit, too, and she asked me if I'd want to start exchanging our food logs each day. It sounds simple enough--we've done this in the past for accountability--but it really does help. 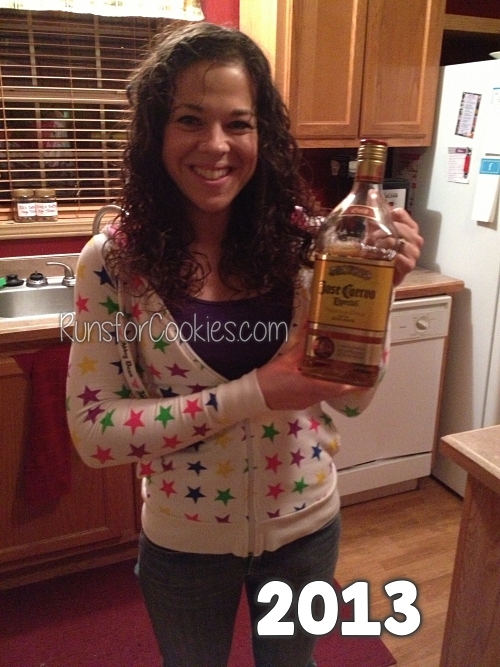 When thinking about my food choices, I remember that I'm going to have to write it down and send a picture to Jeanie. Not that she's judgmental, but there is something about sharing things like that that makes us feel vulnerable. And that can be helpful! I'm going to Phoenix on January 25th (my birthday!) and I'd love to drop some weight before then. Ambitiously, I think I could lose about 10 pounds (the first five will come off quickly due to water weight). But, I would be happy just to get back in the 150's. I don't have any current photos of me, because I've been avoiding the camera like the plague. (Just now, I took a selfie--see below--no make-up, gray roots, and all.) I am going to take some current photos this week because I need to quit avoiding it--avoiding it doesn't make it go away. This is long and boring, but in case you are interested in everything that went into this island (which still isn't finished! ), I'll write it all out here. I saved this for its own post, because it's been--well, I don't want to say frustrating, because I am excited about finishing it--but it's been a process getting to this point. And finishing it is going to be a challenge! When we first started working on the kitchen, I knew that I wanted to do something different with the island. We have a large space between the island and the other side of the kitchen (where there is a sliding glass door to go outside, and the pantry, and laundry room). We've had our dining room table there for years, because we used the actual dining room for the treadmill and bookshelves. I was never been able to come up with a solution for the treadmill. When the boys shared a bedroom, we had the treadmill in the spare room. I knew I wanted to use the dining room area for an actual dining room and move our table and chairs there. 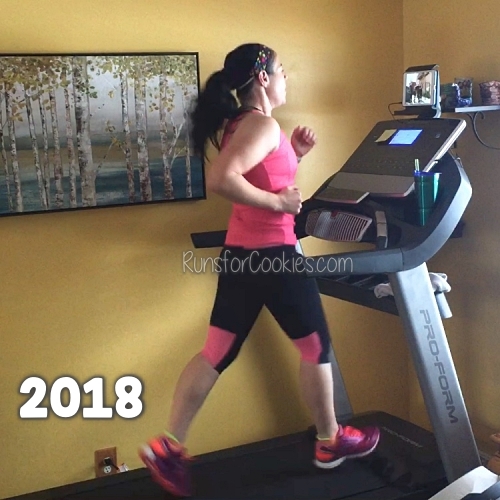 So, by moving the treadmill to the living room and the dining room table to the dining room, we will be left with a large open space in the kitchen where we've kept the table. 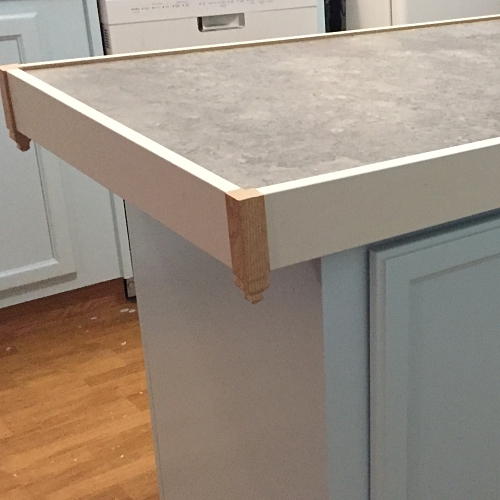 I decided that I wanted to extend the countertop of the island to be about twice as long and put legs on the end. Then we could add a couple of bar stools at the end of the countertop. 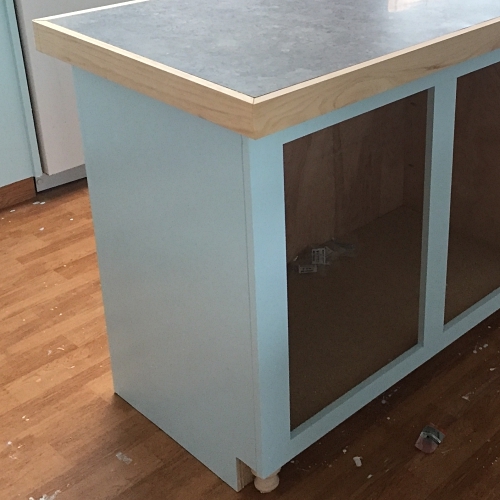 The island that we had was very poor quality, and I knew it wouldn't hold up to a super heavy countertop. So, I decided to reinforce it by adding some framing here and there. But once I started taking it apart, I realized I might as well just rebuild the whole thing with better materials. I actually made the countertop before making the island. The countertop is 92 inches! 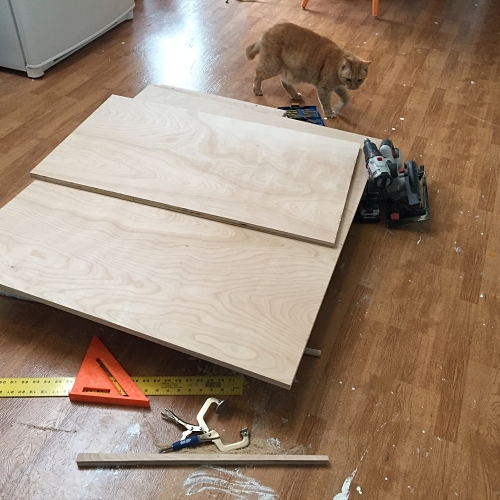 We weren't sure how we were going to finish it, though--put the same laminate down as the rest of the counters? Or something different? 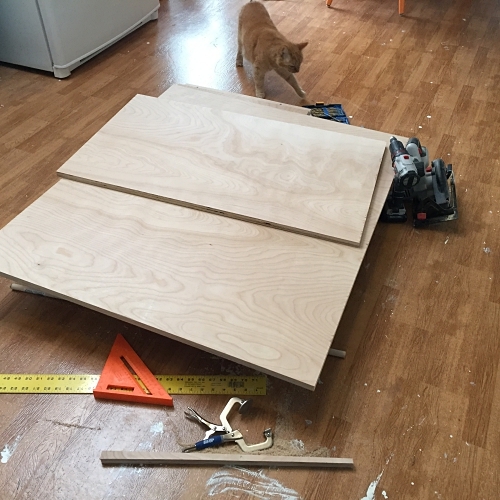 That decision was made for us when I accidentally cut the laminate sheet wrong (yet another mistake for my upcoming post about "What NOT to do when making over your home"). We would have to order another piece of laminate if we wanted to make the counter to like the others. The laminate isn't super expensive, but they charge $24 shipping (a mandatory fee--there is no option to ship to store for free). So, it would've been a lot for just one piece of laminate. First, we cut down the island a little so that it was 25" wide instead of 28". That way, we could still apply the laminate that I'd cut too narrow. However, we didn't have enough laminate for the sides. So, we figured we could add wood trim on the sides to finish it instead of using laminate. I don't have a miter saw, and creating mitered corners for the trim was challenging. They would have to line up perfectly. THEN, we (Jerry was helping me with the framing because it was so large) had to screw the frame on so that the top of the frame was flush with the countertop. I had Jerry hold it flush while I screwed it together. And not surprisingly, we couldn't get it flush--the drill would move the screw just a tiny fraction so that it didn't line up. It's hard to tell in the photo, but the laminate came up above the trim just a touch, so it wasn't flush. Also, the mitered corners didn't fit well together--mostly on the other side that you can't see in the photo. Then, it hit me. 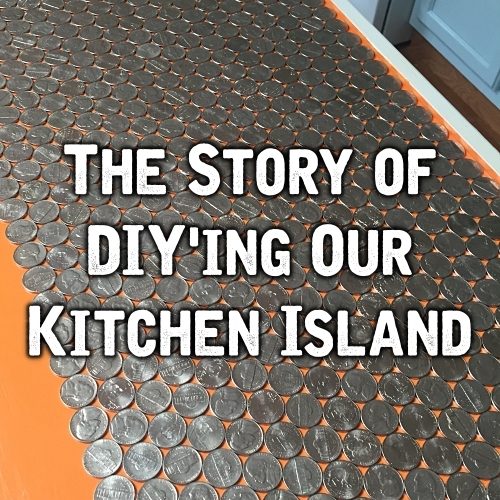 A solution that involved something I've always wanted to try making: a penny countertop (or, in our case, nickels--because they would match the kitchen better than pennies). 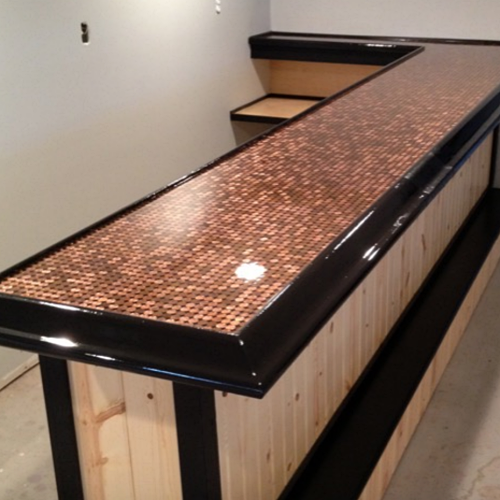 For this, you create a lip around the counter (which you can see in the photo above), and then glue down the nickels. Then, you pour countertop epoxy over the whole thing. And when it cures, it's a perfect countertop that is as hard as granite. 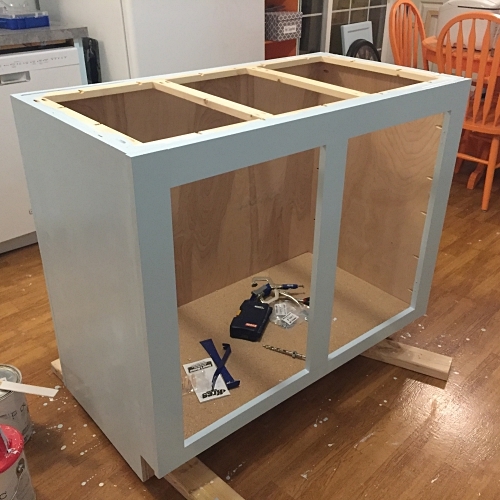 To do this, I shifted the frame up so that it was 1/4 inch taller than the countertop, and carefully screwed that in (thankfully, we got it right on the first try). Then, I primed the entire countertop and trim with oil-based primer. Twice. 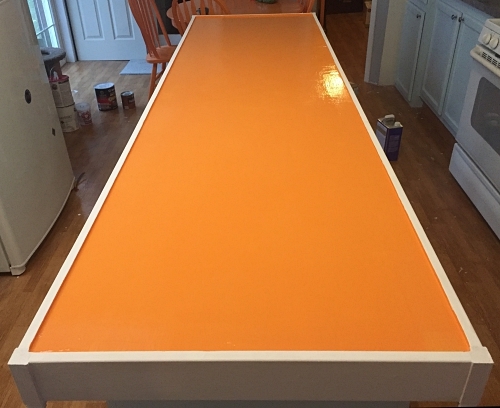 After that, I painted the countertop and inside lip of the trim orange, and I painted the trim itself white. The orange wouldn't show too much, but it would peak out through the nickels a bit. After two coats of paint, I was really liking it! I ordered the epoxy and then saw on the website that if you're coating a surface with oil-based paint, you need to put on at least three coats of oil-based polyurethane in order to make sure the epoxy doesn't separate over time. When that was dry, I was ready to add the nickels. I thought it would be fun to include other silver change as well--some 50 cent pieces from when I was kid, Susan B. Anthony dollars, the quarters from all 50 states, etc. 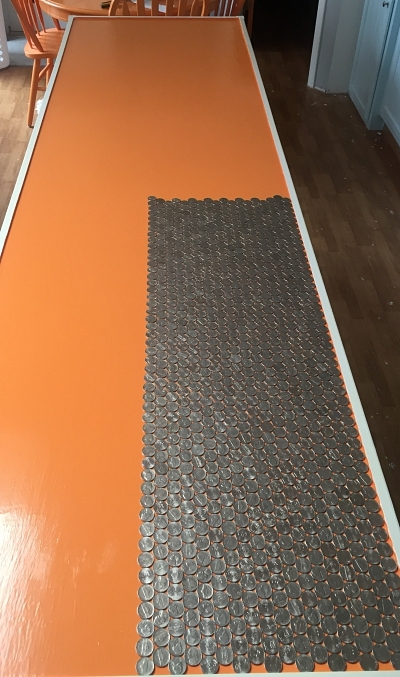 I tried laying it out, but discovered 1) We severely underestimated how many nickels we'd need, and 2) The different sized change made the layout look weird. I removed all of the change except for the nickels, and arranged them so they were butted up against each other. 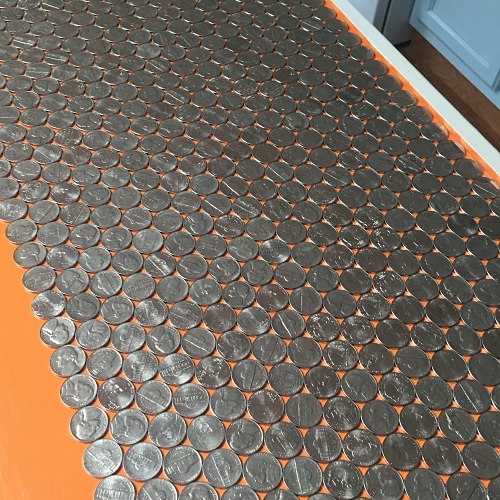 I liked the way it was looking, but after arranging about $50 worth of nickels on there, it wasn't even 1/4 of the way covered! Now, the challenge is the epoxy itself. The epoxy must cure in a space with air temperature of at LEAST 75 degrees--preferably higher. For 72 hours! Considering it's Michigan winter, we are using our furnace and have it set at 68. We will ROAST if we set the thermostat at 75-80. We've been working on a solution to close off the kitchen and use a space heater to make just the kitchen itself 80 degrees. The other option would be to wait until summer, when it's super hot outside anyways. That's a long time away! The countertop will actually work until then if we need it to. So, that's the long story of our island. I hope that when all is said and done, we will love it. With the other projects, even with the mistakes here and there, I've really loved how they turned out. And considering it's all DIY, I think it has character! Always sounding like a broken record: I can't believe it's been so long since I wrote! And it's almost Christmas?! When did that happen? Time has been flying by, and I feel like every spare moment I've had over the last four months has been spent doing something for our home makeover. I don't have a huge update, but we had a couple of fails that I thought would be entertaining to write about (at my expense, haha). 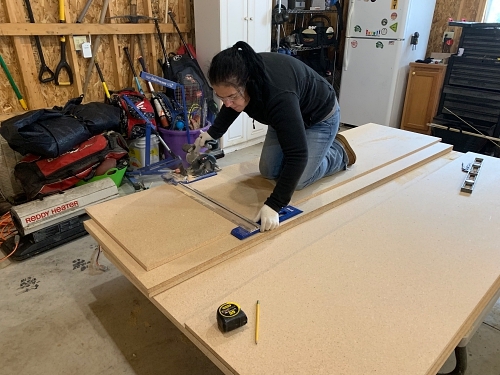 Actually, we have had a lot of things go wrong during this whole renovation, so I'll probably make a whole blog post about it when we are done: "What NOT to do when making over your house". *Choose and install the flooring (the expense is holding us back right now--we have to save up a bit to buy the flooring, because I refuse to go into debt again). *Slowly replace living room furniture (we've gotten a couch and chair, but now I'm looking for a small couch/love seat and some end tables... I'm planning to buy these things used, so I've been looking just about every day for new ads). There is no big rush on these, so we'll just see if something comes along. *Eventually, replace the lighting fixtures. *Replace the door and frame for Eli's bedroom (we replaced the door slabs in the rest of the house, but his room needs a new frame, so we'll do this eventually--it's not urgent). Anyway, remember how I mentioned that I'd like to try reupholstering a piece of furniture? You all know I love all things crafty, and I've been DIY'ing this entire project so far. And I've done a good job of it! So, I expected the upholstery to go smoothly. 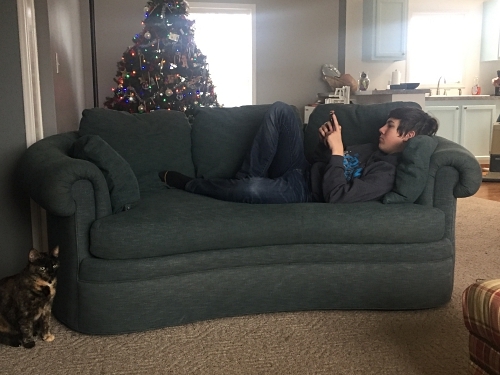 I found a couch at a used furniture store that I could tell was built very well, and we were able to get it for $240. The designer is Charles Schneider, and his company made very high quality furniture back in the day. I did not love the fabric on it (and that's an understatement), but I figured it would be a great piece to reupholster because it has "good bones" underneath. I only had it in my house a few days when my mom saw it and really loved it--as-is. When I told her I planned to reupholster it, she tried to talk me out of it. Eventually, she wanted to buy it from me to put in her house--because the quality was amazing. 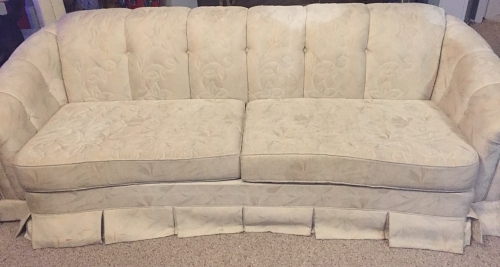 Interestingly, a few days after I sold it to her, I found a couch on Facebook that was so similar I just knew it had to be another Charles Schneider. The fabric definitely needed to be reupholstered, and the price reflected that--they were only asking $30! So, I paid $30 for this couch and planned to try reupholstering it myself. I watched a trillion YouTube videos and I felt like I could do it! Sure enough, it was another Charles Schneider. I worked on it immediately after we bought it. 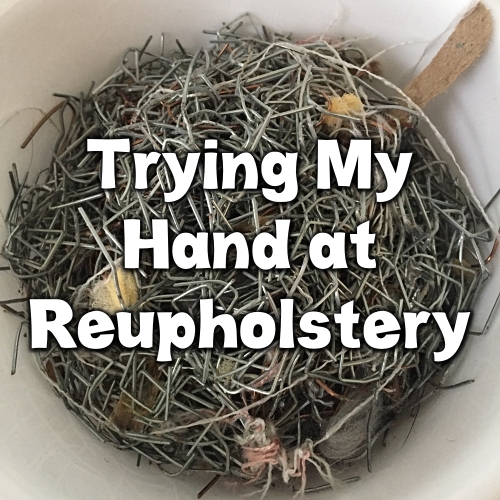 I was really excited to try the reupholstering, because I love learning new skills. 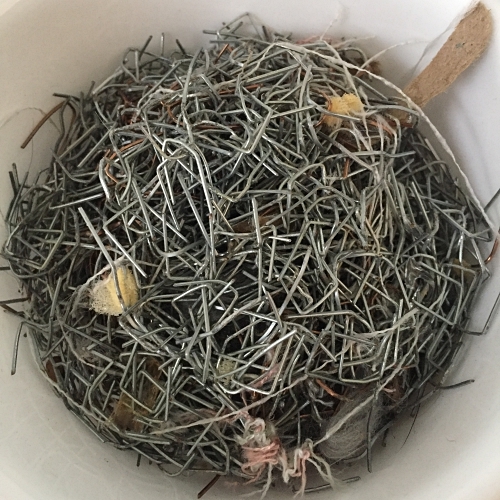 I bought an upholstery staple remover from Hobby Lobby, and went to town on the couch, removing staples left and right. The evening that I worked on it, I kid you not, I spent six hours removing staples. And it still wasn't done. 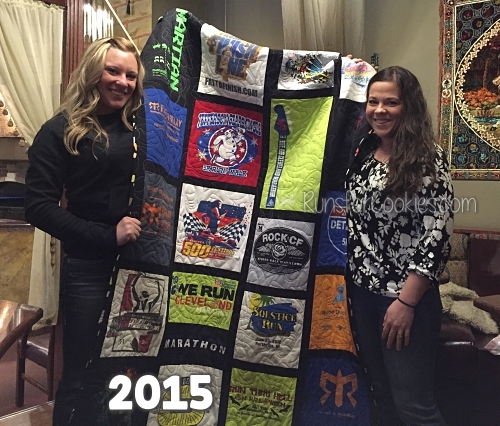 The next morning, I spent another four hours on it, and I finally had the old fabric removed. However, I discovered that due to the style of the couch, it was going to be much more challenging than I expected. Also, thanks to the staple removing, my carpal tunnel came back with a vengeance. I hadn't had many symptoms lately, because I'd taken a break from the tedious painting and things like that. But pulling out all of those staples definitely flared it up. And I knew I'd have to actually staple about two thousand staples back IN to the wood using the new fabric. I felt super overwhelmed, and I decided to call it quits. After 10 hours of removing staples, I didn't even get far enough to start reupholstering. I had discovered that I would need to buy more foam (the couch had been quilted to the foam underneath, so that foam was unusable). Also, the front curve of the couch would make things challenging as well. I should have started on something small, like an ottoman! So, now we are back to square one with the couch. 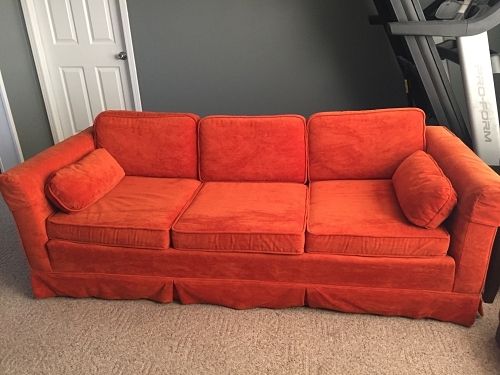 I adore my orange couch and chair, and I clearly will not find another couch to match (if any of you happen to have an orange 1976 Citation by Kroehler sofa, please let me know!) so I'm thinking that gray will work well. I don't want to jump the gun, so I am going to be patient until the right one comes along (like the orange one that I adore!). So, for now, I've learned that upholstering furniture is definitely not my forte, and I'm okay with that. I almost felt relieved knowing that I don't have to worry about it now. Pretty cool, right?! 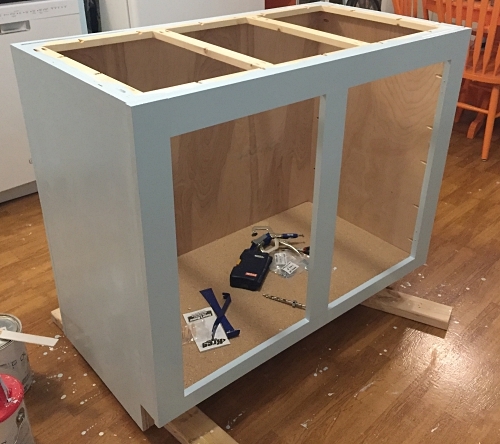 I love love love the Kreg pocket hole jig. I made the whole thing using pocket holes, and it was so fun to build!